Here you will find a selection of useful accessories that are not only used in our kits but are also intended for use on other manufacturers' products and in superdetailing projects. Our trucks are diecast metal and replace the intended model's stock trucks with little or no modification. They roll in brass sleeves for minimum wear and best rolling qualities. All items listed below may be ordered direct if your dealer cannot supply you. These trucks are designed to replace the crude trucks under Walthers Amfleet cars. Just remove the original trucks and screw the new ones in place using the original mounting hardware. These new trucks are diecast metal with side brake shoe detail and correct frame design. The wheels are chemically blackened 36" diameter wheels. They roll in brass bearings for positive electrical pickup and less wear. These trucks roll very well, and you will notice a difference in the car's tracking ability. These trucks are designed to fit our HO scale Budd M-1 cars, Budd Silverliner cars, and Budd SPV-2000 RDC cars. They are the same as #87010, but with smaller 33" wheels. These trucks are designed to be used under Walthers Horizon commuter cars, replacing the not only crude but inaccurate trucks under these models. They are also used under ConnDOT M-2, M-4 and M-6 cars, St. Louis Silverliner II and Arrow I MU cars, and GE Silverliner IV and Arrow II and III MU cars, not to mention all the Comet (Horizon to Walthers) cars. These new trucks are the correct GSI double-frame design, and have the brake shoe detail on the sides as well. 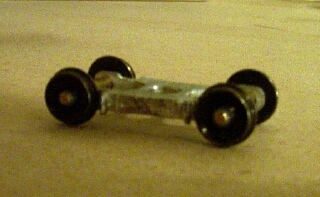 These inboard-bearing trucks fit in place of the original trucks using the original mounting hardware. They have the smaller 33" wheels. They make a HUGE difference when installed both in terms of appearance and operation. This truck has been redesigned for better operation and less axle wear. This is actually one of our parts sets, designed for use with some of our PCC shells to mount them to Bowser mechanisms. Set includes precut brass tubing, 4-40 screws and nuts. These diaphragms fit Walthers Horizon cars and all cars that use this type of diaphragm. The parts are plastic. Three pairs come in a pack. 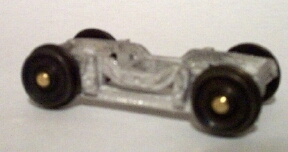 These parts are designed to replace the crumbling, imploding metal underbody parts found under first-run Bachmann Metroliner MU cars (with the drawbars). These parts are cast-metal and use the original mounting hardware. Installation is easy and instructions are included. One set does one car. 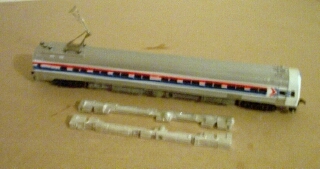 Photo shows a set installed on a Bachmann Metroliner MU car. This pantograph was specially made for us and fits our Arrow I MU car. It also is used on Arrow III MU cars and Metroliner MU coaches. They will fit the Bachmann cars with no modification. Insulators are included. This distinctive design has never been modeled before- ours is the first and only! These diaphragms fit all Amtrak Heritage cars, Superliners, Amfleet cars, Metroliners, Viewliners, Horizon cars..everything. They are cast-metal, so just paint them flat black and scrape away areas to represent metal.